Andrew Fisher, professor of Earth and planetary sciences at UC Santa Cruz, has done influential research on groundwater and aquifers, as well as water circulation in the seafloor. In recognition of his contributions, the Geological Society of America (GSA) will award Fisher the 2016 O. E. Meinzer Award from the GSA's Hydrogeology Division. The award's namesake, Oscar Edward Meinzer, served as chief of the U.S. Geological Survey's groundwater division for 34 years and has been called "the father of modern groundwater hydrology." Fisher will receive the award, recognizing his "distinguished body of work in the field of hydrogeology and, particularly, marine hydrogeology," at the annual meeting of the GSA in September. In marine hydrogeology, Fisher has done pioneering research on how vast quantities of ocean water circulate through the seafloor, flowing through the volcanic rock of the upper oceanic crust. He has also spent decades studying groundwater in the Pajaro Valley, where saltwater intrusion due to overpumping of the aquifer is an ongoing problem. The prolonged drought in California has added new urgency to Fisher's Recharge Initiative aimed at replenishing groundwater supplies. He and his students have been designing and studying the performance of recharge ponds where managed runoff from storms can soak in and restore depleted aquifers. 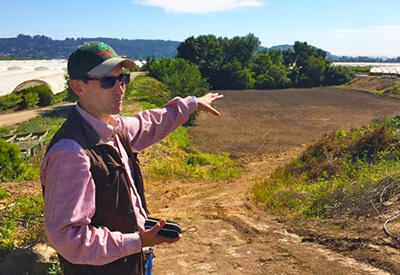 Fisher is the UCSC campus lead for the UC Water Security and Sustainability Research Initiative and coauthored a recent report on sustainable groundwater management. "What is most interesting about Fisher's approach is how it couples scientific principles with what is possible in a complex and political world," said Leigh Bernacchi, coordinator of the UC Water program. "Through conscientious development of relationships among farming, management, and stakeholder communities, he has helped to create novel incentives for recharge, including a new program for net metering that will help to offset operational costs." California Institute for Water Resources: "Mr. Recharge"